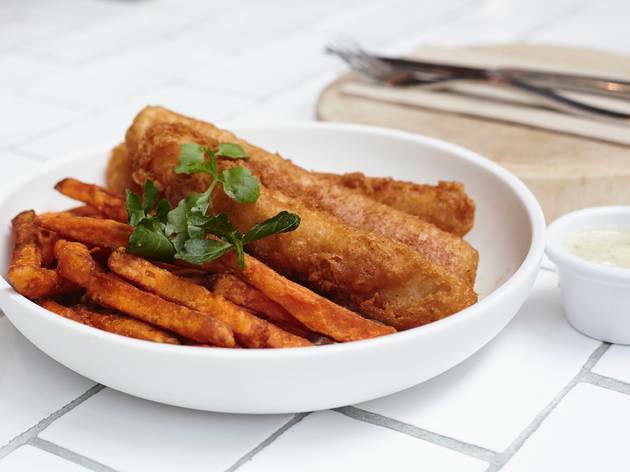 Sustainable seafood purveyors Fish & Co have moved from Annandale into their new home in Harold Park’s Tramsheds, where they’re as popular as ever. These guys are deeply concerned with the provenance of their products, and ensuring that there’s still plenty of fish left in the sea for future generations. 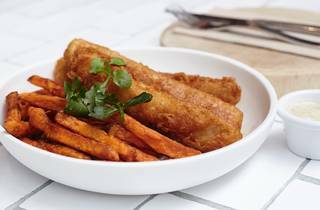 Strips of New Zealand hoki come coated in a golden beer batter that’s a little on the thick side but still has a nice snap. You can jazz things up by substituting regular fries for sweet potato chips. The calamari also comes from the waters of New Zealand, and like all of the seafood here, is treated with the utmost respect. Those wanting a break from tradition can choose from options like mackerel fish cakes and panko crumbed tiger prawns. Eat in if you’re feeling fancy, or for a cheaper option, grab takeaway and find a spot outside in the sun.